Download for PC. Request a copy here. Fix EV3 Rover is a fun game where you get to program a robot vehicle using instructions loosely based on the LEGO® MINDSTORMS® EV3 programming language. Completing each level of this game will help you learn basic programming techniques that are particularly useful for participating in FIRST® LEGO League (FLL®) competitions. No robotic equipment or previous programming experience is necessary. EV3 Rover is a robot vehicle sent on a rocket from Earth to the planet Nuftobor. Unfortunately a major solar flare occurred shortly after takeoff, erasing all programs from the robot’s memory. While EV3 Rover made it safely to Nuftobor’s surface, it cannot move on its own without programmed instructions – instructions that YOU must provide! Your goal is to Fix EV3 Rover so that it can complete its mission of exploring its new surroundings. 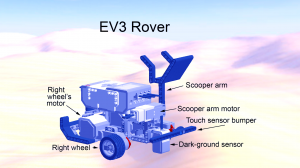 EV3 Rover is equipped with motor-driven wheels for moving and turning, a sensor to detect dark-colored ground beneath it, and a front touch sensor bumper to detect obstacles in its path. In later levels of the game you can program its scooper-arm to lift, carry, and drop boulders found on the planet’s surface. You’ll face challenges that require logical thinking and spatial intelligence, while being guided through progressively more complex game levels. And if you forget the meaning of any programming symbols, you can easily look them up using the in-game symbol dictionary. Get ready for a fun and engaging adventure as you Fix EV3 Rover! Available on iPhone®, iPad® and iPod touch® devices using iOS 9 or later at the Apple® App Store. Available on Mac® machines with OS X 10.10 or later (and designed for use with 1280×720+ classroom projectors) at the Mac App Store. Available on PC for use with Windows® 7 or later machines, with 1280×720 or higher resolution monitor or classroom projector, by request here. Available on Android™ 4.0.3 or later devices at the Google Play Store. Send comments and suggestions to the developer of Fix EV3 Rover here. Explore the relationship between skills developed in Fix EV3 Rover, and programming robots to compete in FIRST LEGO League competitions, here. If you’re looking for something more challenging, upgrade to Fix EV3 Rover Pro and get exciting new levels and features for a nominal fee. But honestly, completing the twelve levels available in the free version of Fix EV3 Rover will get you well on your way to being able to solve many of the challenges offered in FLL competitions. LEGO®, MINDSTORMS®, and LEGO® logos are trademarks of The LEGO® Group, which does not sponsor, authorize or endorse this product. FIRST®, and all of its trademarks, FIRST®, FIRST® LEGO® League, and FLL® are trademarks of FIRST®, which does not sponsor, authorize or endorse this product. Microsoft and Windows are trademarks of Microsoft Corporation. Apple, Mac, iPod touch, iPhone and iPad are trademarks of Apple Inc. Android is a trademark of Google Inc.